potete dirmi che moneta e.monetata.jpg grazie. SEPTIMIUS SEVERUS. 193-211 AD. AR Denarius (2.88 gm). Emesa mint. 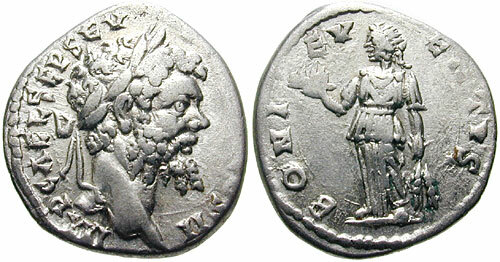 Struck 194-195 AD. IMP CAE L SEP SEV PERT AVG COS II, laureate head right / BONI EV-ENTVS, Bonus Eventus standing left holding basket of fruits in right hand, grain ears in left. RIC IV 369; BMCRE 343; RSC 68.